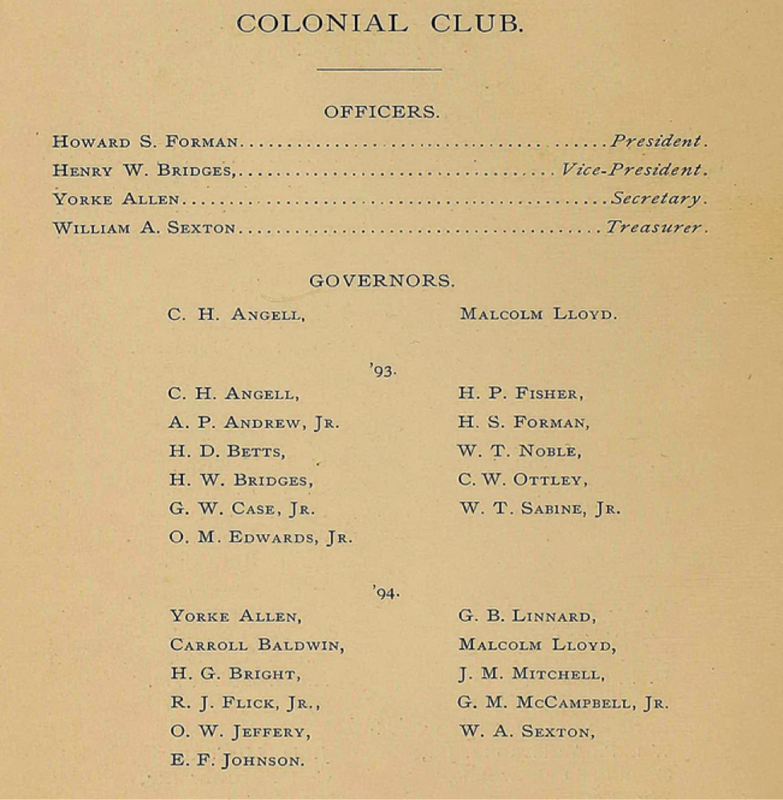 Colonial Club was founded in 1891, fifth of the eating clubs. It drew its name — mistakenly, it would seem — from its first clubhouse, an old ship captain's house on Nassau Street, thought to date to the Colonial period. In fact, it dates to the Federal period and still stands in the same location near the intersection of Nassau and Queenston Place: a narrow stone building, well back from the street, with three distinctive porches stacked atop each other. Perhaps one of Colonial's early attractions was its location near Evelyn College for Women, but after several years the club decided to move. In 1893, it relocated to a pleasant Victorian house at 178 Nassau Street, opposite the recently built Aaron Burr Hall. This arrangement lasted for more than four years, until Ivy Club moved from its clubhouse on the north side of Prospect Avenue to its new and more commodious lodgings across the street. Colonial acquired the old Ivy building and in the spring of 1897 began extensive remodeling work. A former member of the club, Frank Stewart '96, served as the architect. He completely transformed the building by superimposing a "Colonial" facade, complete with columns and a central pediment. This entrance is framed by a pair of Palladian windows. Of all the exterior details in the old Ivy House, only the dormer over the east porch survived. In the summer of 1906, lightning hit the building and burned a hole in the roof. Rather than repair the old structure, Colonial chose to erect a new clubhouse. This was the period when competition between clubs was at its most intense, and Colonial attempted to rise to the architectural challenge of its neighbors across the street — Cottage and Ivy. 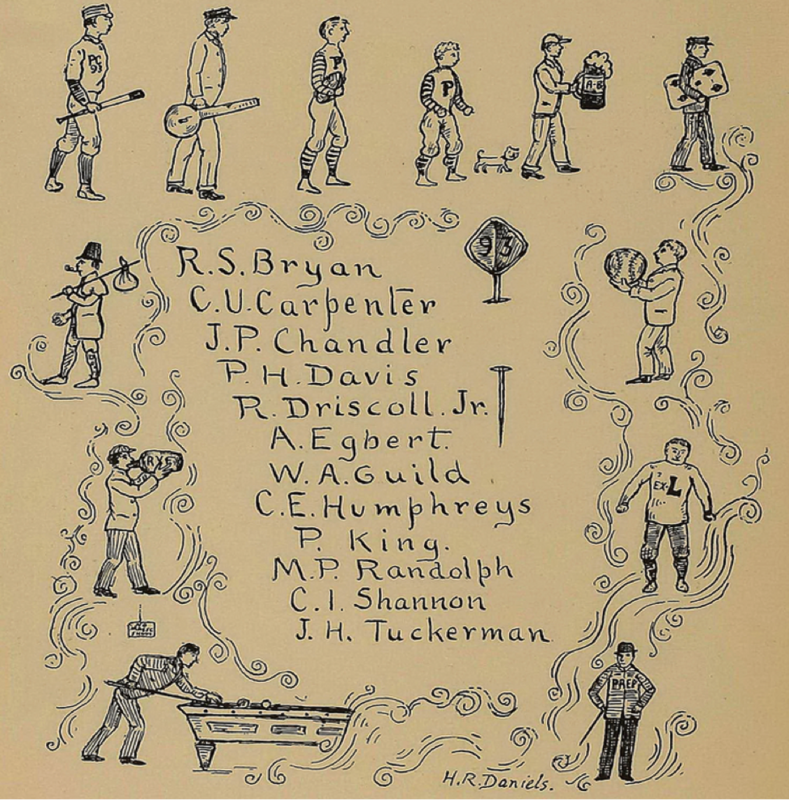 Stewart returned to design the new clubhouse, and his rendering includes a number of subtle elements and details that were altered in proportion in the actual building. In particular, the entrance portico was smaller in the rendering. The large Palladian window on the west end was replaced by two smaller windows in the building as erected. And two of the first-floor windows feature polygonal bays, providing relief for the flat brick facade. It is 105 feet long -- not so coincidentally, the exact length of Cottage -- the two rear wings measure 45 feet while the center section is 30 feet deep.